The Municipal Nutrition Council (MN) and the Jagna Emergency Medical Rescue Unit (JEMRU) brought evaluators from the national and regional levels to visit Jagna and evaluate the said units of the Local Government Unit. The MNC evaluation was conducted on May 26-29, 2015 and the JEMRU evaluation was conducted on May 26, 2015. The Municipal Nutrition Council after 3 Green Banner Awards in Nutrition in the years 2010, 2011, 2012 earned the Consistent Regional Outstanding Winner in Nutrition (CROWN) in 2013. To be able to get the Nutrition Honor Award for 2015, the highest award to be conferred to a city or a municipality, it has to maintain its national standing for 2014 as CROWN Maintenance Awardee thus the evaluation. A score of 95 for 2014 performance must be earned by Jagna to enable the municipality to get the Nutrition Honor Award in 2015. The National Evaluating Team was led by Maria Cynthia Vengco of the National Nutrition Council (NNC) in Manila. Members are Mr. Armando Manglicmok also of the NNC, Mr. Michael Pablan of the National Economic and Development Authority (NEDA), Ms. Eden Rouela Ruta of the Nutrition Foundation of the Philippines (NFP) and Mr. Teddy Pelaez of the Department of Health. Assisting in the evaluation were Dr. Parolita Mission, Regional Nutrition Program Coordinator NNC RO 7, Ms. Nasudi Soluta also of NNC RO 7 and Ms. Juliet Manliguez of the Provincial Nutrition Office. 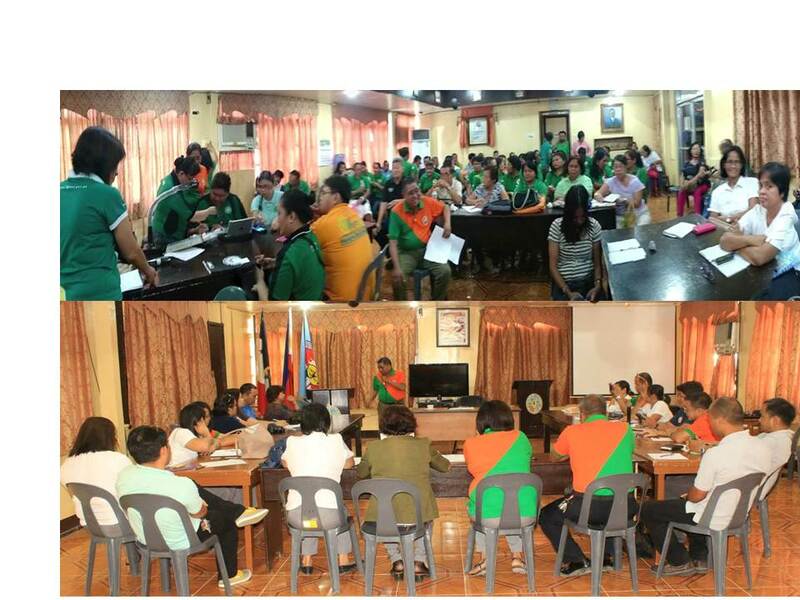 On the same day, a team of evaluators headed by Office of Civil Defense 7 Regional Director Olivia Luces evaluated the JEMRU. The JEMRU was the municipality’s entry into the Regional Gawad KALASAG Award for the categories on Government Emergency Response Management, Heroic Act/Deed during Emergency Response and Rescue Operations. The Gawad KALASAG is the country’s premier annual awards for outstanding contribution in the fields of disaster risk reduction and management and humanitarian action. Other entries of Jagna are Special Recognition Awards, Local Disaster Risk Reduction and Management Council (LDRRMC), NGO/CSO partner (BIDEF) and Barangay Disaster Risk Reduction Management (Can-upao). Top: Nutrition evaluation presentation of the National Evaluating Team headed by Ms. Maria Cynthia Vengco with the municipal officials, members of the Municipal Development Council and members of the Municipal Nutrition Council. Bottom: Mayor Fortunato R. Abrenilla welcomes the regional evaluating team for the JEMRU headed by OCD RDO 7 Olivia Luces with the members of the Local Disaster Risk Reduction Management Council.